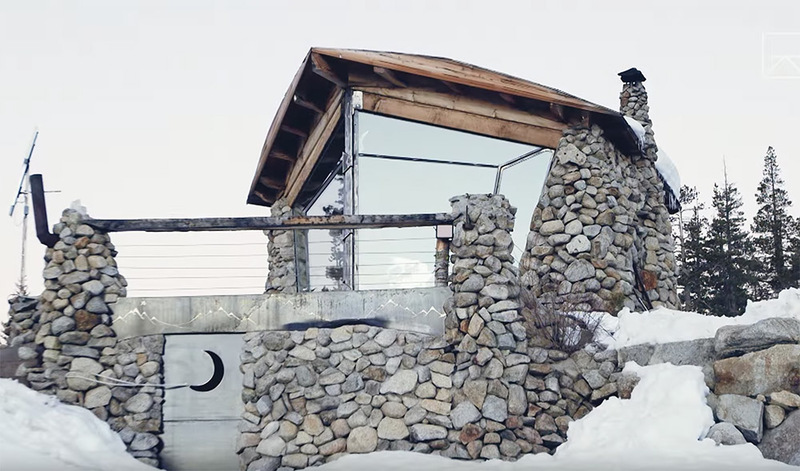 Hundreds of competitions on the professional snowboarding circuit brought Mike Basich fame and plenty of money to purchase the American dream: the 4,000 square foot house, the fancy car, and myriad other material things. 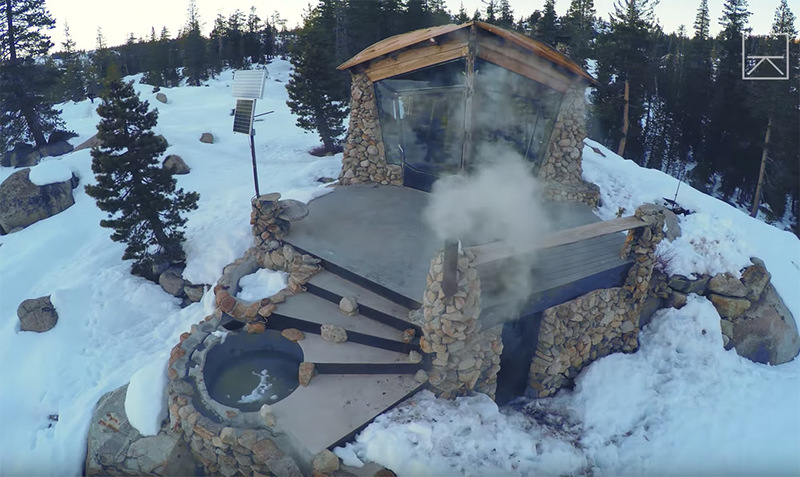 Mike purchased 40 acres of land near Truckee, California, where he lives completely off the grid in this beautiful tiny house he built by hand. He constructed it over a period of 5 years. Half of that time involved the rock work alone; he moved over 175 tons of rock, and water for concrete, to build many of the features on the exterior and interior of the home. Mike says that the process of building his off grid home made him stronger, taught him many lessons, and ultimately fulfilled his childhood dream. This is truly sustainable living on a very small footprint. Water for the kitchen sink is piped into the home from one of the two streams that run through the property. The home has no bathroom; a rock-walled shower area sits in one corner near the fireplace (and doubles as a seating area when not used for showering) and the toilet is outdoors. A wood stove is used to keep the home warm and to heat water for cooking and bathing. 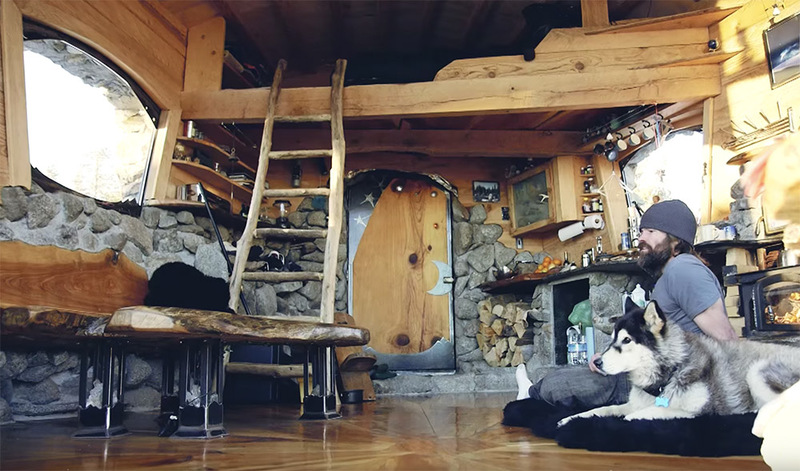 A small oven built over the wood stove is where Mike cooks his food. As he states, this fireplace is pretty much the “central utilities” area of the home – the source of warmth, the place to cook, and the place to heat water. A ladder leads up to the loft bedroom where Mike sleeps. You’ll see many stars throughout the home, which represent an integral part of the design. The home’s layout is based on the golden ratio; the shape is a pentagon, and when the dots of a pentagon are connected the result is a star. This ratio is said to represent nature and make a home feel more “fit to the body”. The glass wall at the south end of the home provides fantastic views of the forest, lets in abundant light, and acts as a source of passive heating. A small solar panel setup supplies the electricity to the home. From above, you can see the beautiful deck and steps that lead down to a hot tub. Can you imagine relaxing here at the end of a long day? 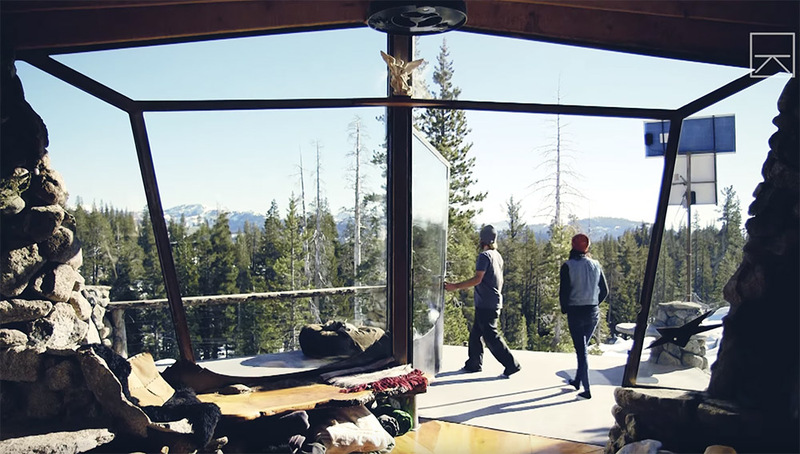 This is off grid living at its finest – completely immersed in nature. For Mike, nature drives his creativity. 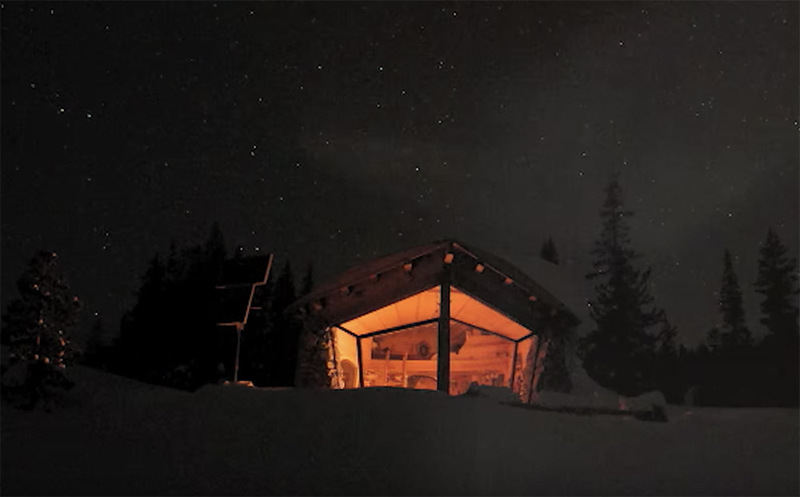 He left the world of professional snowboarding and now spends his time in the backcountry with a camera, shooting snowboarding images and video. Nature inspires me, and that’s why I choose this kind of environment…I’ve ended up here, off the road, off the beaten trail, and I’m loving it. I like to think of it as getting back to the basics of humanity. I like feeling connected to the Earth more than I could in the 4,000 square foot house. 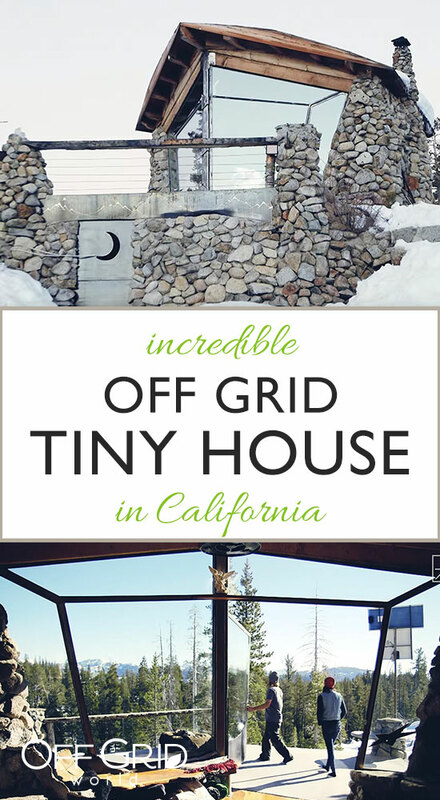 See the video below for an interview with Mike and a tour of his off grid tiny home. It’s inspiring to see someone not afraid to leave modern living and build something like this with their own hands, learning as they go.